Game Of Thrones stars, Kit Harington and Rose Leslie, who played on-screen lovers in the epic TV drama tied the knot today. 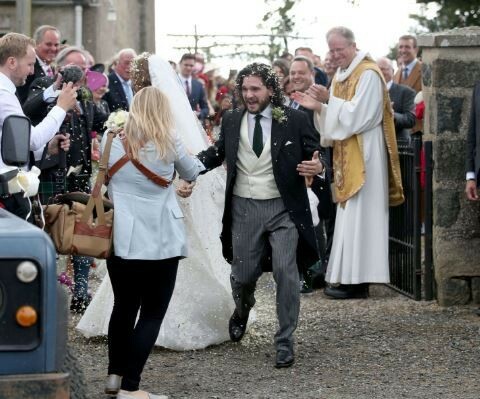 Harington and Leslie tied the knot at Rayne Church in Aberdeenshire. She wore a full-length white wedding dress and he was dressed in a traditional morning suit. The actors met in 2012 while filming the long-running saga in Iceland, where they were play Jon Snow and Ygritte. The actress – whose full name is Rose Eleanor Arbuthnot-Leslie – is a descendant of Charles II and her family owns the 12th-century Wardhill Castle in Aberdeenshire, where the ceremony took place. STARBOY Set To Drop A Jam With Tiwa Savage! Mayorkun Set To Drop First Album Ever! Wizkid Links Up With Investor BJ | Awesome Photo!